The Amcrest ProHD 1080p Wi-Fi video camera helps you stay in touch with what you love anytime, anywhere. With its quick mobile setup process, you will have secure access to your camera's video stream in no time. Stream live and playback recorded video of your home, your kids, your pets, or your business on the go with the Amcrest View app. Amcrest Cloud offers optional cloud recording with free live viewing and 4 hours of free video storage accessible from any device including Apple Mac, Windows PC, iPhone, iPad or Android devices. Amcrest cameras also record to an internal MicroSD card (not included), upload to an FTP as well as record to any Amcrest (or ONVIF compliant) Network Video Recorder (NVR) (not included). 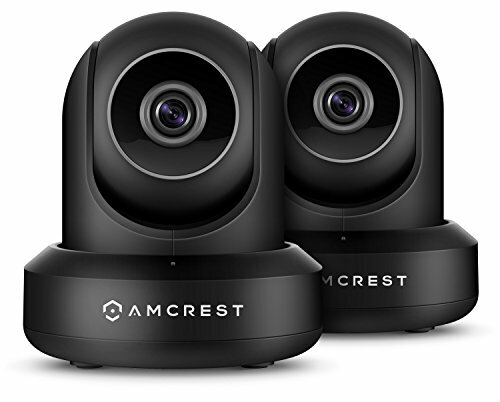 Each Amcrest camera features two-way talk, night vision, remote pan/tilt, enhanced digital zoom, a 90º viewing angle, smart motion alerts, email alernts and snapshots, advanced recording options, secure SSL/HTTPS connection and wireless AES WPA2 encryption. With the Amcrest ProHD, you'll never be out of the loop again.